Famously known for its architectural project gone wrong - the home of Galileo (who dropped pebbles from the leaning tower to test his theory of gravity) has a lot more to it than just one wonky tower. Pisa is such a popular destination there are all kinds of accommodation on offer. Some of the best places to stay in Pisa are actually just outside the city in the Pisa hills. This area was a popular destination with travellers as early as the 17th Century when people used to stay in the 'luxury resorts' of the time. The hillside mansions where people could relax, taking both the waters of the thermal spa at San Giuliano, and see the sights of Pisa. Although no longer a maritime power, Pisa is still an educational one with several elite universities. The big student community keeps Pisa vibrant and there's a healthy bar and cafe culture, which is more reasonably priced than you'd expect from a city so appealing to visitors. One of the world's most iconic landmarks, the Torre di Pisa is an absolute must-see for visitors to Pisa. The building famously leans a dramatic 14 feet out of line! Construction began in 1173 so is hugely interesting from a historical perspective. If you have the time it's worth making the effort to climb the tower - the view is quite something. Right beside the tower are the magnificent Duomo and Bapistry which make up an architectural trinity unequalled in Italy. Strolling round the historic quarter could lead you to the 12th century Basilica di San Pietro a Grado, the masterpieces of the Museo Nazionale di San Matteo, or perhaps to Lord Byron’s former residence, Palazzo Toscanelli. The tame grass of the Piazza dei Miracoli is where most people will want to start their visit to Pisa, including day trippers hellbent on ticking the tower off their list. The Duomo and the Battistero - with its perfect acoustics - are also part of the Piazza dei Miracoli, as is the cemetery, the Campo Santo Monumentale. As well as being famous for the soil, brought back from Calvary, the cemetery has much beautiful art and a collection of Roman sarcophagi. Toward the town centre is the other main historic centre, Piazza dei Cavalieri. Also worth strolling around are the streets on both sides of the Arno around the Lungarno Mediceo. This area has the real character of Pisa where there are many beautiful buildings to be discovered. If you're interested in the history of Pisa then the art museums are definitely worth exploring. As is the Museum of Ancient Ships, a relatively new museum built to house the nine cargo ships excavated from Pisa's harbour in 1998. Pisa is a major tourist destination with it's sights drawing visitors year-round so book early to secure one of the best places to stay in Pisa. The Royal Victoria is a wonderful grand dame of a hotel, and one of the best places if you're looking for traditional luxury in a central location. The Royal Victoria's decor is awash with beautiful antiques, and the roof terrace has wonderful views over the city. The buildings began as the Winemaker's Guild and Inn, the central tower of which was built in the 10th Century. 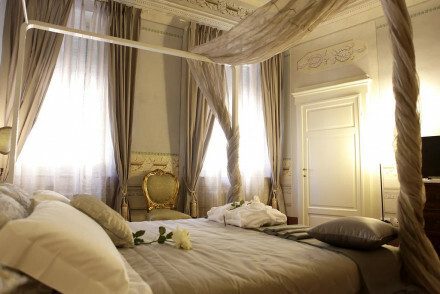 For a chic B&B, 7 Rooms is a small B&B in the heart of Pisa. Four simple yet contemporary white washed rooms are light and airy and some feature small balconies. Triple and quadruple rooms make this a great stay for families or groups. Walking distance from Pisa's main sites. A convenient and well priced choice. Relais dell'Orologio is a 14th century townhouse hotel which offers an authentic old fashioned atmosphere teamed with modern comforts. Breakfast is on offer and afternoon treats and pastries are served daily in the communal sitting room. Rooms are air conditioned and have period features. A stylish choice for exploring Pisa. The Bagni di Pisa Hotel and Spa is an historic 18th century nobleman's house turned stylish boutique spa hotel just outside Pisa. Traditionally decorated rooms featuring all the mod cons. The real draw is the spa featuring thermal waters, mud therapies, a traditional hammam and much more. Low calorie gourmet cuisine and great views too! If you'd prefer your own space, don't hesitate to visit our online partner Booking.com for a range of properties throughout the town. Fly to Pisa International Airport, situated only 5km (3 miles) from the city with a range of onward connections to Europe. 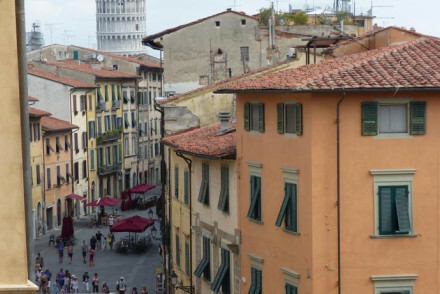 Catch a train to Pisa with regular services to Florence and Lucca. Best time to visit - June to September is the summer and also peak tourist season so visitors looking for cooler temperatures and lower prices might prefer to visit in April to May. Expand your search to include our recommendations in Florence or Tuscany? A small B&B in the heart of Pisa. Four simple yet contemporary white washed rooms are light and airy and some feature small balconies. Triple and quadruple rooms make this a great stay for families or groups. Walking distance from Pisa's main sites. A convenient and well priced choice. 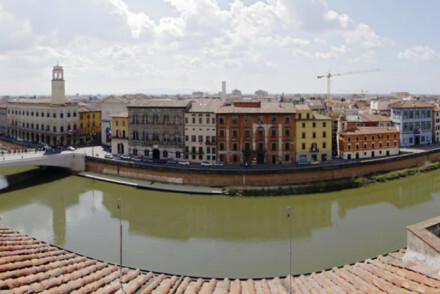 Local exploring - Situated right in the heart of Pisa with many sites within walking distance. Value chic - A simple, well positioned, hotel with rooms at very reasonable rates. Great walks - Take a stroll around the Botanical Gardens located right next to the hotel. Sights nearby - A short walk from Pisa Cathedral and the Leaning Tower of Pisa. 14th century townhouse hotel which offers an authentic old fashioned atmosphere teamed with modern comforts. Breakfast is on offer and afternoon treats and pastries are served daily in the communal sitting room. Rooms are air conditioned with period features. A stylish choice for exploring Pisa. 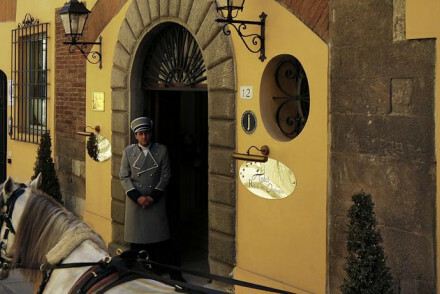 Historic 18th century nobleman's house turned stylish boutique spa hotel just outside Pisa. Traditionally decorated rooms featuring all the mod cons. The real draw is the spa featuring thermal waters, mud therapies, a traditional hammam and much more. Low calorie gourmet cuisine and great views too!